Welcome to part one of our 5 part guide to growth stock company analysis! Being able to analyze a company’s fundamentals is absolutely crucial to success with investing. It’s why we developed this guide. It’s a fairly complicated process, exactly why the guide is spread across 5 days. This gives time to digest the info and begin a study yourself if you wish. Let’s get started! Although some growth stocks do pay a dividend, the majority re-invest earnings into the business to fund expansion. Growth investors expect to achieve capital gains through an increased stock price, due to positive return from said expansion. They are typically smaller and younger companies, early in their life cycle. Finally, investors looking at growth stocks are more concerned with their future potential, and not necessarily their present results. For the purposes of this 5 part guide, we are going to be following the theoretical company with a ticker “ABC”. There are thousands of stocks available on the stock market, and many growth stocks are speculative investments. As such, investors need a means to pare that number down through a stock screener. The first criteria we use is market capitalization. Although there are many small and speculative stocks that are growing at an impressive pace, we prefer to target stocks with a market capitalization of at least $500 million. Although not without risk, it helps mitigate and eliminate some of the more highly speculative investments. Finding the market cap is fairly easy as the majority of brokerage accounts and major investing websites including Stocktrades.ca post these numbers. However, it is important that we learn where the market cap comes from. To do so, simply fill out this market capitalization formula and you will have your number in no time. Let’s look at how ABC’s numbers stack up to our first and initial screening formula. 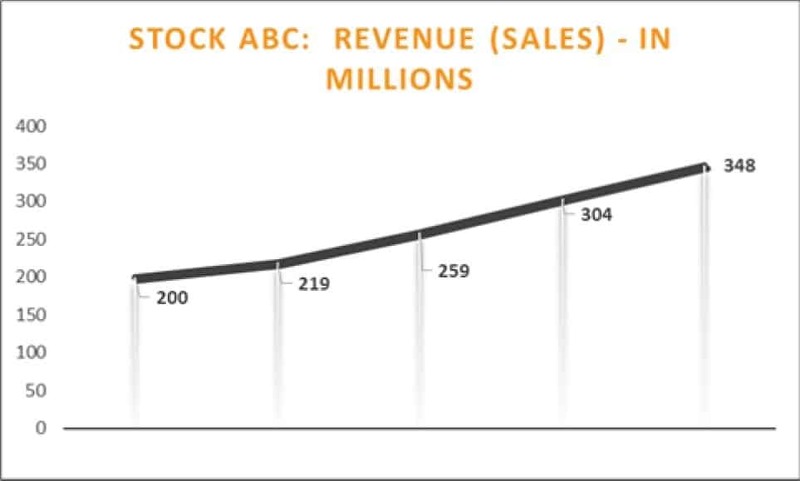 Great, stock ABC’s market cap exceeds $500 million. The choice is up to you of course, but in our opinion, investing in stocks with less than $500 million in market cap calls for increased volatility. It is always up to the individual investor to determine his or her risk tolerance. A growth stock is one that by definition, is expected to grow earnings above the market average. As such, earnings are the second criteria we use. Like we said above, these companies do not issue a dividend in most situations. Although a dividend is welcomed, you are more interested in increased earnings. Growth companies look to invest their profits back into the business, and in the end reward shareholders with higher price per share. Studies show that investors can expect that the average earnings of the market to grow in-line with the Canadian economy which is not expected to breach 3% over the next five years. As you would expect, 3% growth is not significant, and we prefer to target companies that expect to grow earnings by at least 10%. As per the National Association of Investors Corporation, a good barometer for growth companies is projected growth rates of more than 10%. 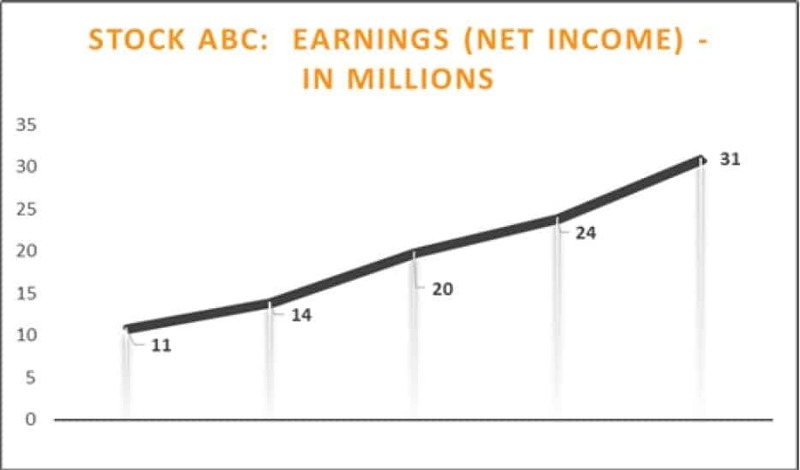 As an example, say we look at ABC’s annual report and they are expecting ABC’s future earnings growth rate to be 33%. We would consider this a very strong indicator that this stock may be poised for a breakout. In another hypothetical situation, let’s say stock ABC has a market cap of $517 million but expected future earnings growth is only 5%. We may want to move on to another company. With those two simple criteria, investors can significantly reduce the number of investment options and comfortably select any stock from the list and begin their DD. It’s completely fine if you are scrapping a bunch of growth stocks from your initial list. The narrower your list, the more specific analysis and effort you can put into each company. Now we start to get down to the nitty gritty of growth stock analysis, starting with their historical analysis. It is important to note, that many attractive and highly invest-able growth companies have yet to post positive earnings. Case in point: Amazon. However, we still believe it’s important to know if the company is profitable or at the very least, reducing its losses. Criteria 1A – 5 Consecutive Years of Earnings Growth. We want to observe the company’s last 5 years of net income and make sure either the losses are heading towards a break even level, or their profits are going up. We want to observe the company’s last 5 years of sales and figure out if the numbers are going up. A company who is spending their profits on expansion and not growing sales is a warning sign that they may not be spending wisely, and you may be better off looking elsewhere. Growth companies often burn through cash as they grow their business. This is to be expected as companies need access to capital to expand. A company that can generate positive operating cash flows is less reliant on debt or stock offerings. Likewise, companies that have successfully grown operating cash flow are better positioned to take on additional debt to fund growth. A company who is unable to grow cash flows will find it very difficult to raise cash to fund expansion. It is important not to confuse OCF with Net Income; they are not the same. Net Income includes non-cash transfers (such as depreciation) where money may not have actually exchanged hands. The OCF is a more accurate indicator of the health of a company’s operations. It only takes into account the cash sources and cash expenditures of a company. We want to observe the company’s last 5 years of operating cash flow. In simpler terms, the operating cash flow of a company is simply the amount of cash generated by normal day to day operation of the business. This historical data mentioned is accessible on multiple investment websites, but the best and most accurate source is either through the company’s own website, or SEDAR filings. As you’ll notice, stock ABC failed on the OCF criteria but that doesn’t necessarily mean it’s a bad investment. Historical analysis is only the first step we have presented and there is many more criteria to analyse. It will be rare that one company will check-off all the boxes, but what it does do is help investors identify areas where more research needs to be done. 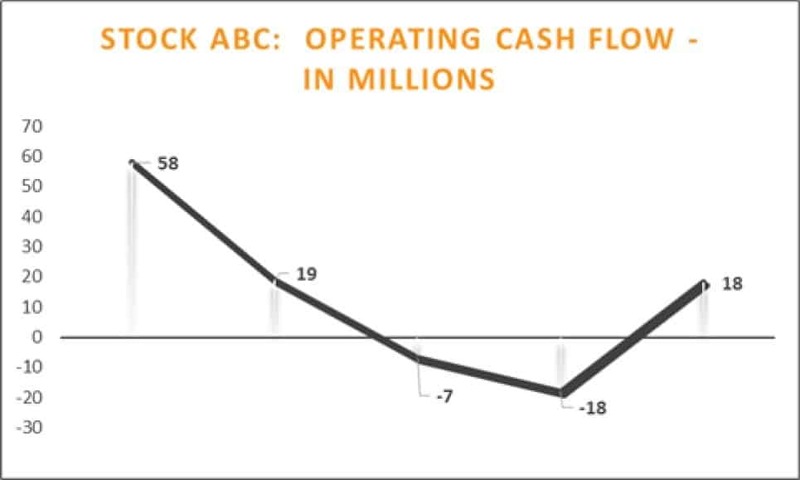 As an example, let’s say we look into the cash flow statements for stock ABC and it tells us that the company increased its loan receivables portfolio, which had a negative impact on operating cash flows. The positive aspect of this, is the increase in its loan receivables will lead to future cash flow growth for the company.